Looking for welding invoice templates? We've got you covered! Do I need more than just a welding invoice template? You're a welder, so you're good at making things with your hands, but that might not necessarily translate to creating an invoice to send to your clients. That's where invoice templates come in. You shouldn't have to do more work just to get paid for your work, so using a template means we've already done the hard work, you just have to fill in some basic information. We're here to make sure you get paid for a job weld done. No? Don't worry, our invoice templates are much better than our puns. See for yourself. 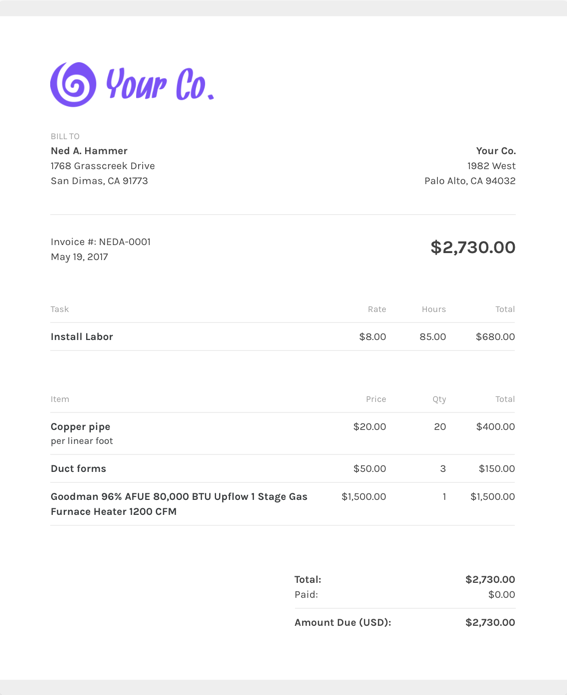 What should I include on my welding invoice template? One popular thing about ZipBooks is that we will help you through every step of sending your first invoice. We help you to know what to include in your invoice based on real-time feedback. Using ZipBooks for your welding invoice means never forgetting to include critical information. We’ve collected data from tens of thousands of invoices and use it to score your invoice based on what information you include so you’ll get you paid faster. Why should I use ZipBooks’ welding invoice template to create and send my welding invoice?